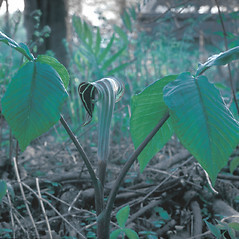 Jack-in-the-pulpit has leaves with three leaflets, distinguishing it from its congener green-dragon (Arisaema dracontium), which has 5-13 leaflets per leaf. 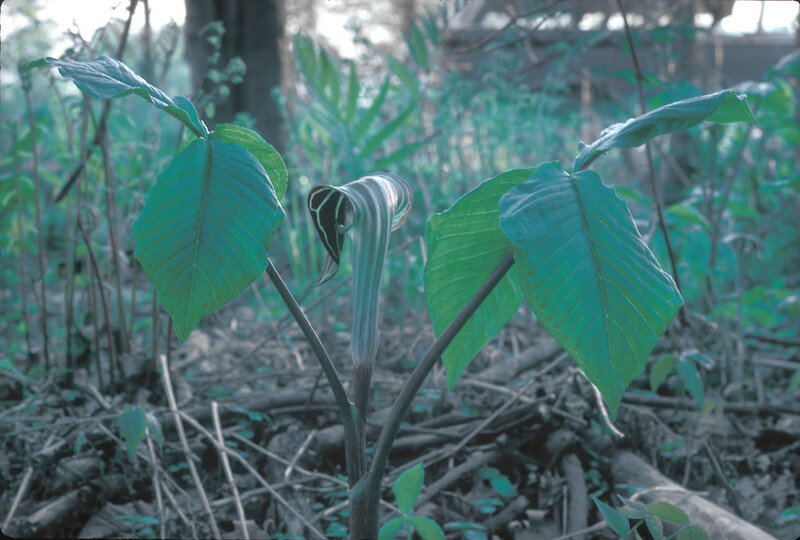 Native Americans used the roots of jack-in-the -pulpit for a large variety of medicinal purposes, especially eye and respiratory conditions. 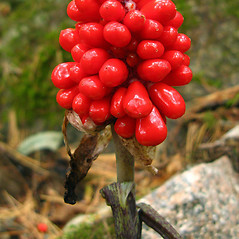 They considered the root very poisonous without careful preparation. 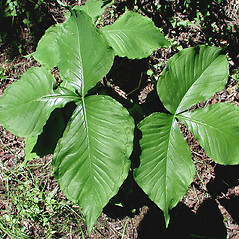 There are three subspecies present in New England. 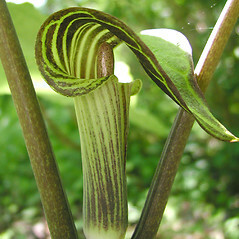 Arisaema triphyllum (L.) Schott ssp. 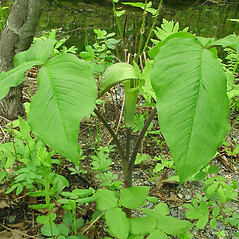 triphyllum is known from CT, MA, ME, NH, RI, VT. A. triphyllum ssp. 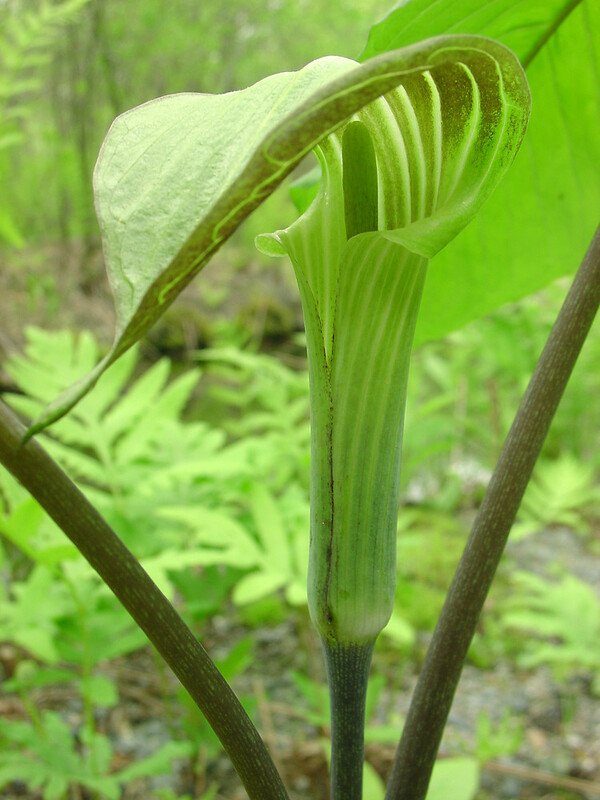 pusillum (Peck) Huttleston is known from CT, MA, RI, VT. A. triphyllum ssp. 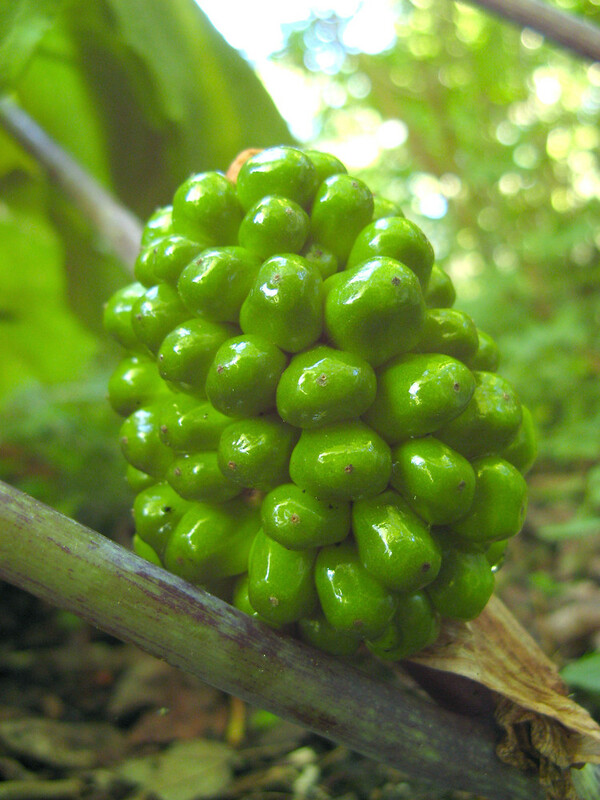 stewardsonii (Britt.) 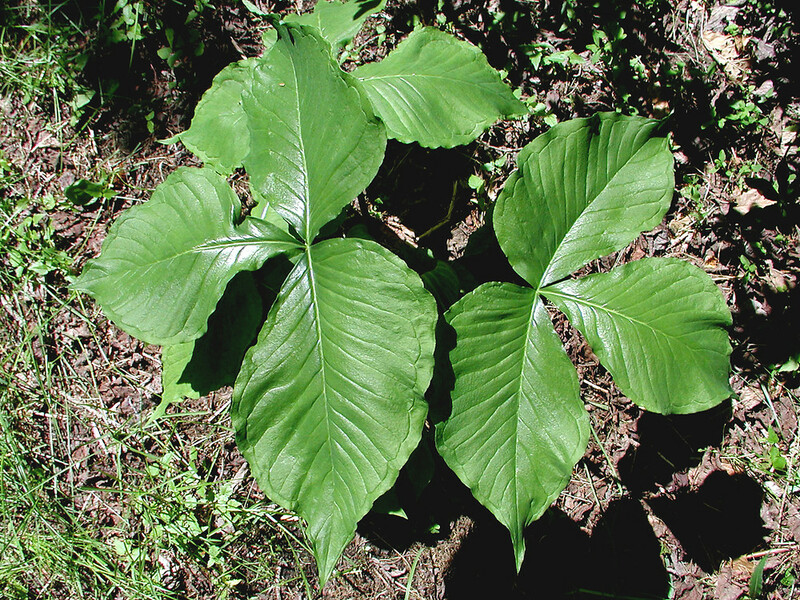 Huttleston is known from CT, MA, ME, NH, RI, VT, and is restricted to wet soils. 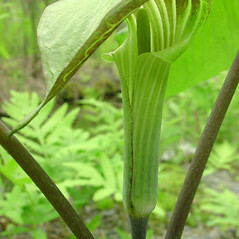 Jack-in-the-pulpit. 2a. 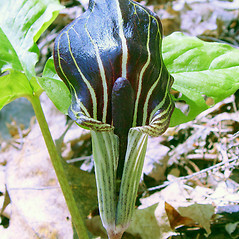 Arisaema atrorubens (Ait.) Blume; 2b. 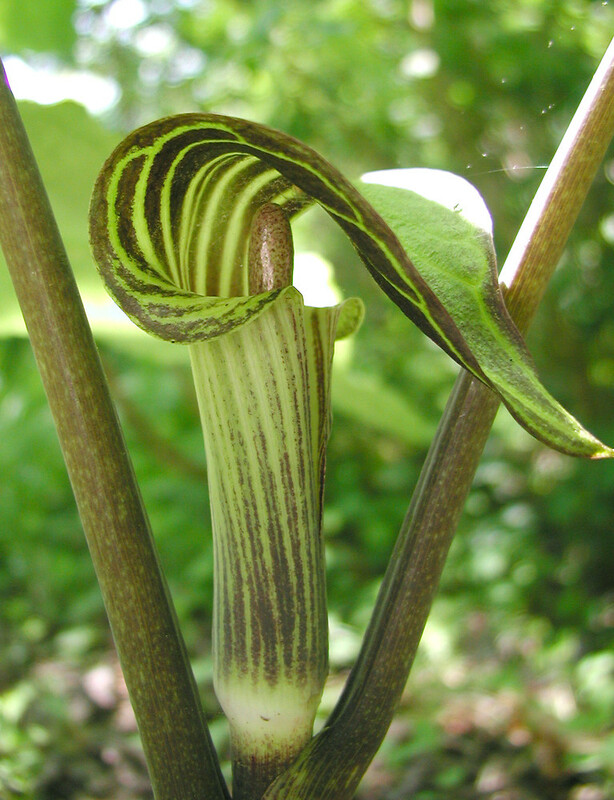 Arisaema acuminatum Small; A. pusillum (Peck) Nash; A. triphyllum (L.) Schott var. 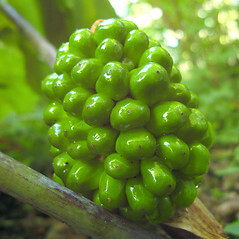 pusillum Peck; 2c. 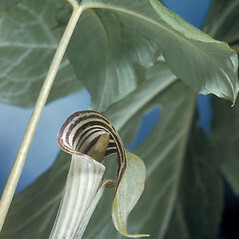 Arisaema atrorubens (Ait.) 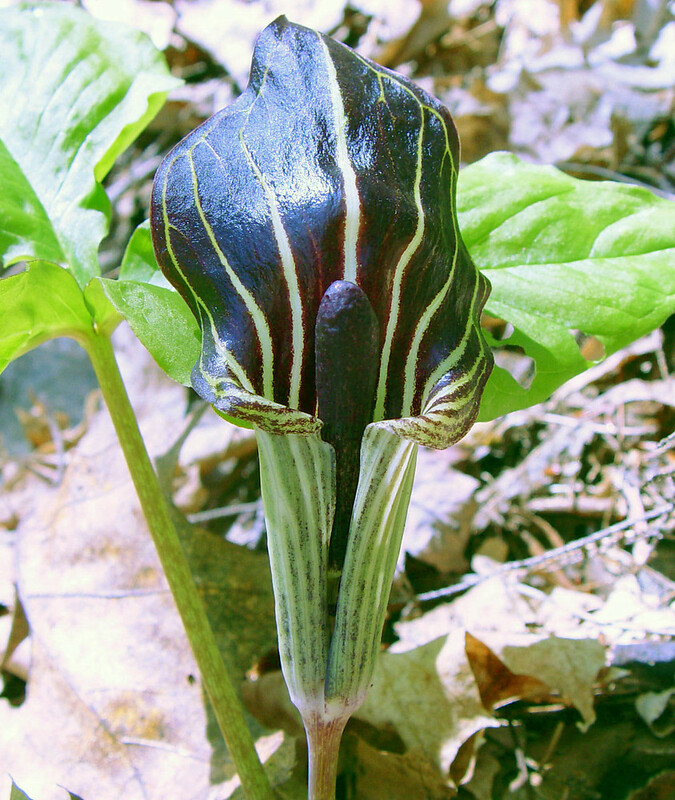 Blume var. 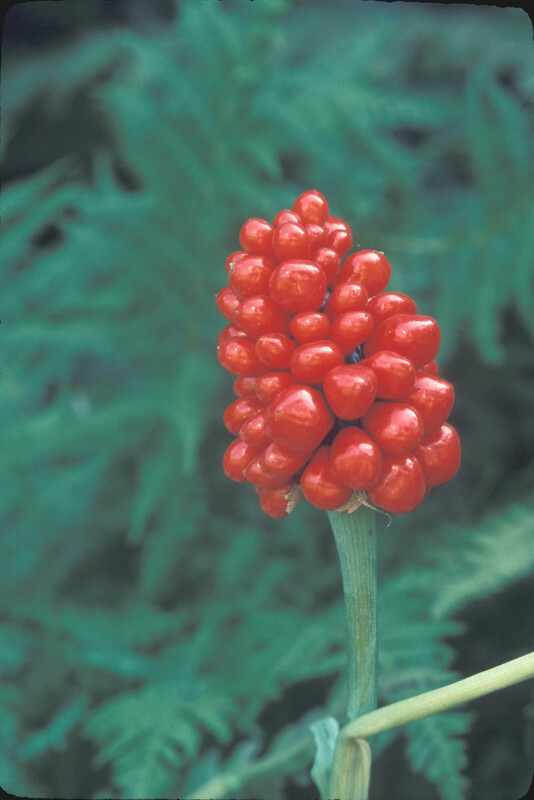 stewardsonii (Britt.) 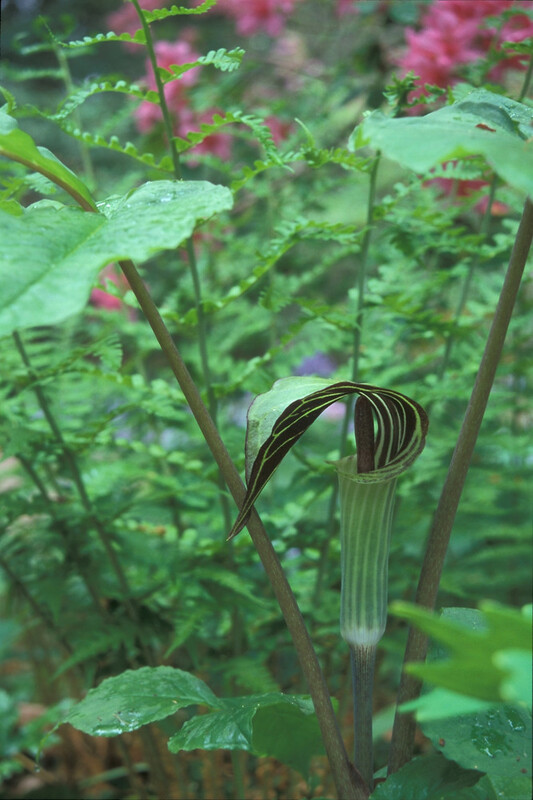 Stevens; A. stewardsonii Britt. 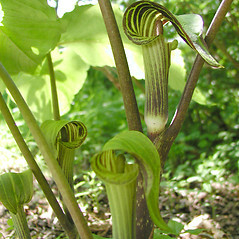 ; A. triphyllum (L.) Schott var. 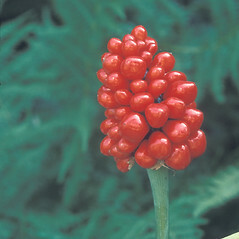 stewardsonii (Britt.) Stevens • CT, MA, ME, NH, RI, VT; throughout. 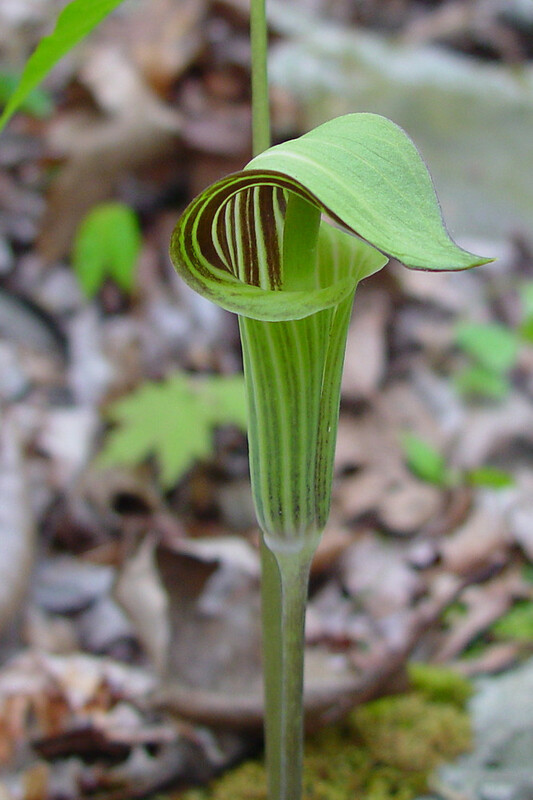 Mesic forests, swamps, riparian forests, peatlands, and wetland edges. 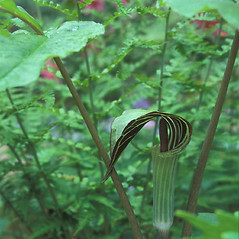 Three varieties of Arisaema triphyllum are found in our area. 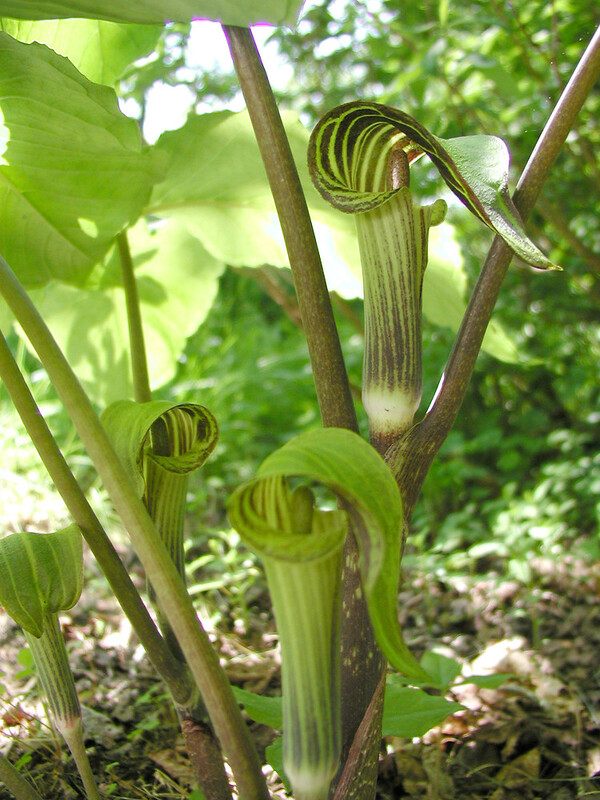 They are morphologically distinct and show some ecological separation. 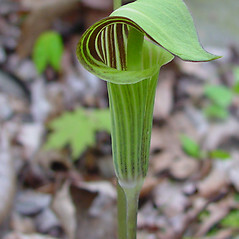 Further, there are ploidy level differences between some of the taxa. Some authors choose not to recognize these varieties because hybridization is known between them and some characters are lost in pressing and drying. However, neither of these is a valid reason for not recognizing tracheophyte taxa. 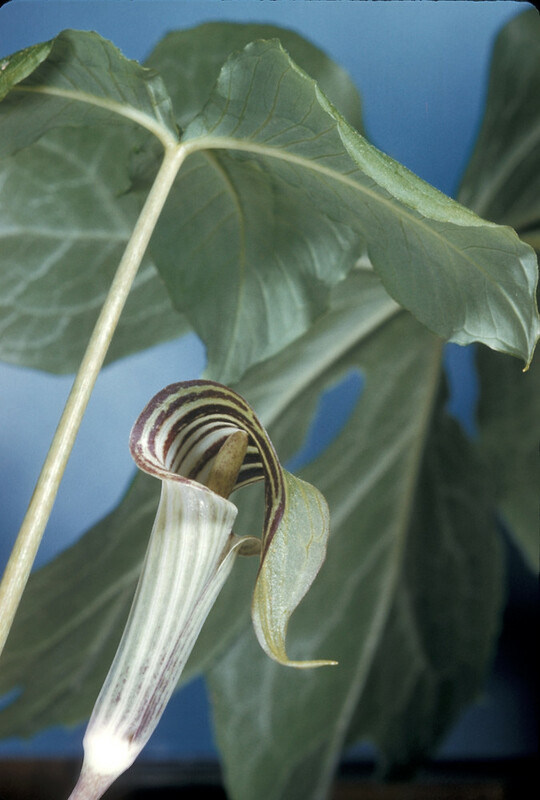 Characters such as presence vs. absence of bloom on the leaf blades, fluting of the spathe tube, and orientation of the spathe flange (all lost or obscured on herbarium specimens) are best noted in the field so they can be recorded on herbarium specimen labels. 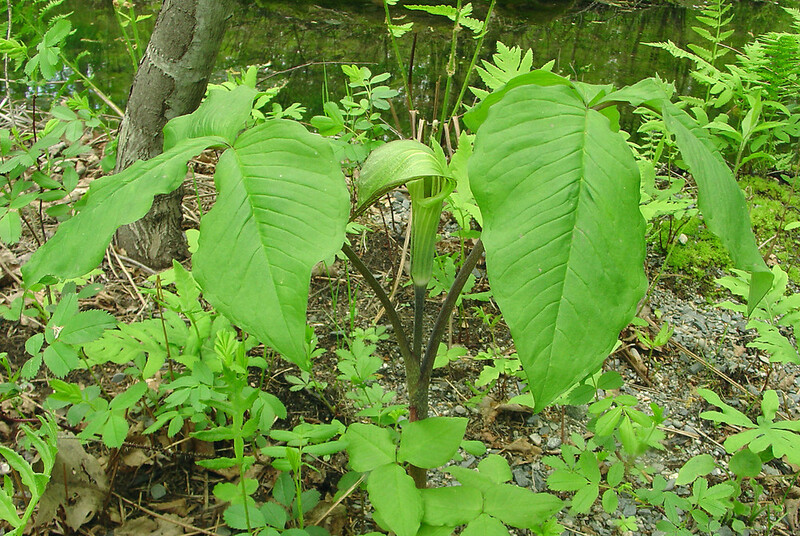 Subspecies triphyllum is known from CT, MA, ME, NH, RI, VT. Subspecies pusillum is known from CT, MA, RI, VT. Subspecies stewardsonii is known from CT, MA, ME, NH, RI, VT. 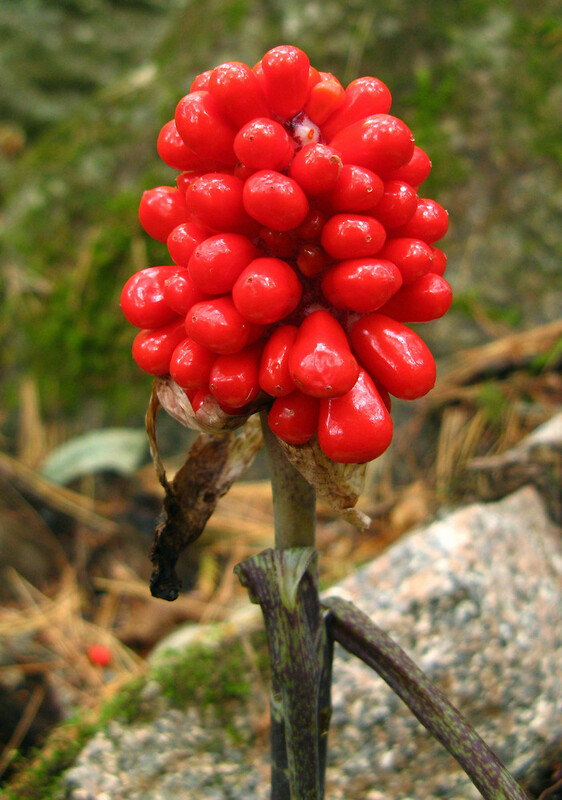 It is the most ecologically restricted of the subspecies and is ± confined to hydric soils.